Hello and welcome to GunGame5, the latest and greatest version of GunGame. GunGame5 not only boasts extensive speed improvements, but mind-blowing customization opportunities! 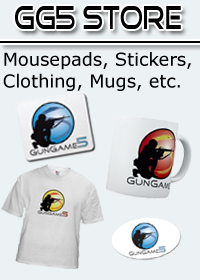 The GunGame 5 Forums are a central hub provided for coders and GunGame fanatics alike to share their love for GunGame. We are dedicated to supplying these forums (and our time) as a resource to those who love GunGame with no intention of any revenue. However, anyone who would like to support this formation can do so by donating so that the cost of server, domain, and etc. can be covered. Donating $50 will make you a GunGame5 Sponsor for a year. To learn more about GunGame5 sponsorship or donations in general, click here.